Marsha finished her Recoleta by Joji Locatelli made with Neighborhood Fiber Company Studio Worsted. Marsha loves this sweater! 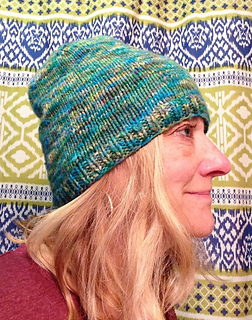 After testing several hat patterns for our Single Shot contest, in the end Marsha made up her own hat pattern using Two Ewes Raucous Rambouillet from the shop. Marsha is obsessed with combo spinning. 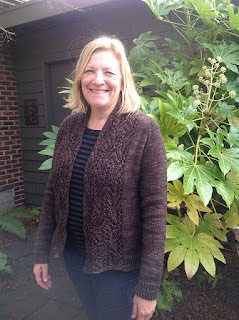 She cast on Beeline by Heidi Kirrmaier with her first combo spin. She is loving knitting with her yarn and seeing the colors change. 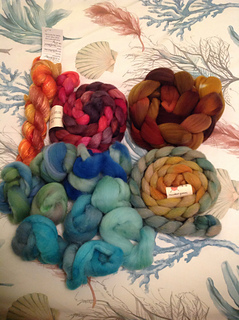 Marsha started her second combo spin with rovings she bought from vendors at Fiber Fusion Northwest. black/charcoal roving that is not shown in the picture. but Marsha was able to salvage the single. 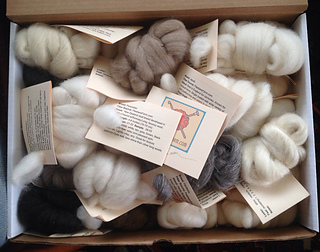 At Fiber Fusion she also bought a breed study sampler pack of 32 fibers from Fleeber Fibers. 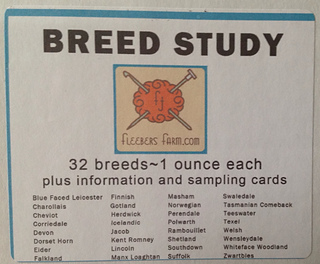 These are the breeds represented in the box. Kelly has been knitting charity hats and cowls. So far five hats are finished, all using very old spirit yarn. Another hat and cowl are in progress. A fun long weekend camping trip was the place for three hats to be finished. A second hat finished while camping! 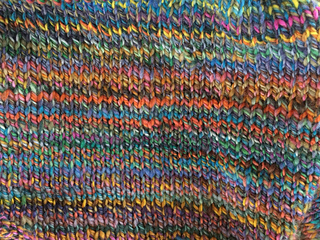 An upcoming conference will allow for finishing the cowl. Kelly has some sweater plans. One is an old pattern from a 2007 magazine. 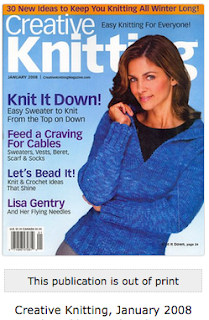 She got rid of old knitting magazines, but did save some of the patterns that she had marked as potential so long ago. Knit it Down is one of those patterns. An Elizabeth Doherty pattern also caught her eye as a MUST KNIT! 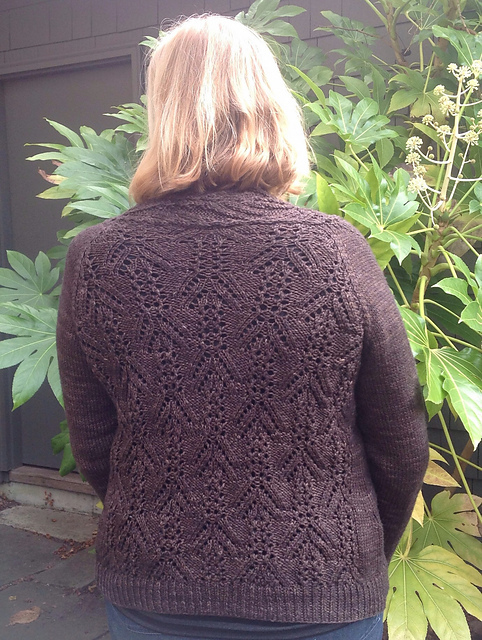 The pattern is Bodie, a textured cardigan with a long, almost coat-like, silhouette. 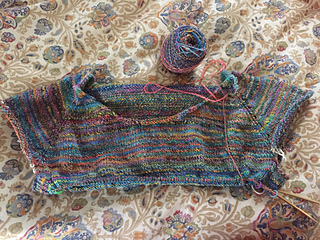 The Handspun Cowichan sweater is moving quickly but hasn't been worked on in almost two weeks. The colorwork is giving Kelly a challenge (3 strands, 2 hands! ), so she is being selective about when to work on it. What's happening with bees in November? On the California Central Coast they're still busy as bees! Bringing in pollen and nectar and going strong. Well, two of the hives are still going strong at least. There have been late summer/early fall losses. Wishing all the US listeners a Happy Thanksgiving! We're thankful for all of our listeners in every corner of the world. 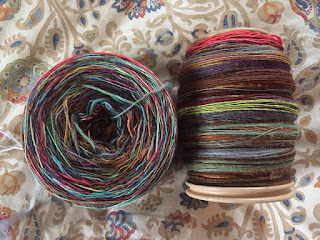 You have been so supportive and we're happy to have you join us each episode for knitting, spinning, and fiber talk. Thank You!